You know the buzz… Avocado toast. It’s all the rage, and to be honest, I can’t blame the rage. Avocado toast in itself is delicious, and avocados are typically on our counter during the week. So as I was sitting around one late morning, I noticed an avocado, a ripe one that was ready for the taking, and as I got up to look around to see what I could make with this lonely avocado, I decided I would do my spin on an avocado toast. 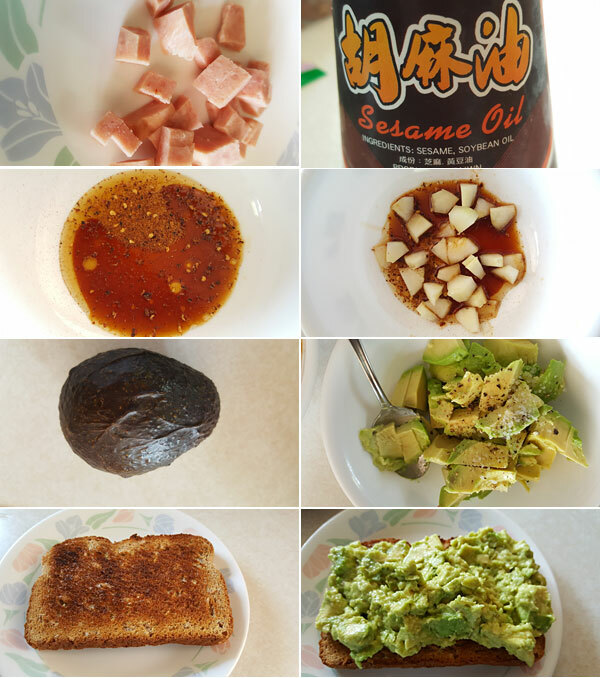 Let me introduce to you the Spam and Avocado Toast recipe. Now I know what you are probably thinking right now. Spam? Yes, spam. I’ve dabbled with spam over the years, and as some may frown on the idea of spam, I actually have grown to like it, especially when cooked properly. Properly, meaning nice and crispy. There are two reasons I decided to use spam in this recipe. One is that I did not have bacon (I know, I know…) and two, I had spam! This combination was actually really delicious, and if you did not know that it was spam, I think you would probably agree. Start by marinating your cucumber. To a bowl, add the sesame oil, chili flakes, soy sauce, and give a good mix. Add the cucumbers, give a gentle stir, and set them to the side. Now the spam. To a small skillet add the oil on medium to high heat. Let that oil come to temp for a minute then add in the cubed spam. Stir and cook the spam until it is nice and crispy. During this time, get your avocado ready. To a small bowl, open that avocado, being careful not to slice open your palm (yep, people are doing it based on this whole avocado toast thing), and scoop it into the bowl. Use a fork and lightly mash it adding some salt and pepper to your taste. Check that spam. Crisp? Cool. Remove it from from the heat and lets toast the bread. Pop the slice of bread into the toaster and get it nice and golden brown. 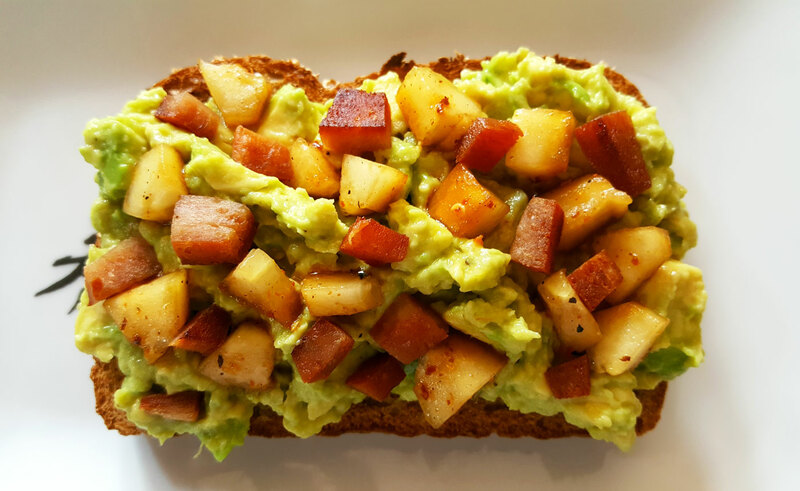 Toast it so it holds up to everything when you build the spam and avocado toast. OK, lets build this baby. Take the slice of toast, spread on that avocado, layer on the on the cucumber (and only the cucumber) and crispy spam, and get ready to eat. You tell me, but when you take a bite of this avocado toast, you will be blown away. That crunch and softness from the spam, the crispness and spice from the cucumber, and the creaminess from the avocado, all in a handheld bite sized form. Yep, I’m sold. It’s good, and good enough to have you questioning (possibly) why you haven’t been eating spam all of this time. Enjoy!